Crowbar Collective mapper Chon Kemp generously agreed to talk to us about the game’s future updates. He has given us in-depth responses to many of the itching questions you all have about Black Mesa’s development. We’ve included some sneak peak images too. According to Raising the Bar, Surface Tension was designed to pop that claustrophobia bubble developed through the game and to show that things aren’t that nicer on the surface. Did you play the original feel of the chapter straight, or did you innovate it with your own reinterpretation? If so, can you tell us what your artistic aim was? 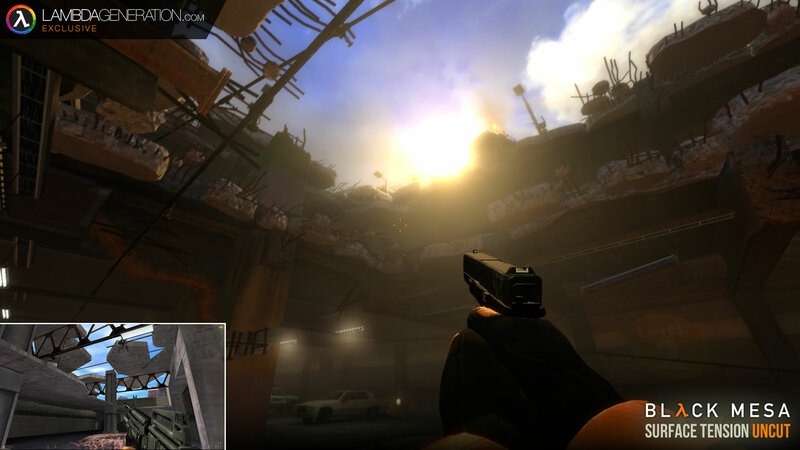 Our artistic aim with the entirety of Black Mesa was to expand on the original masterpiece in ways which were simply not possible at the time due to the technology, as well as putting our own unique flair and artistry on it. Surface Tension is one such chapter which showcases this process of reinterpretation. When you play the original Half-Life 1 Surface Tension nowadays, it doesn’t quite live up to that goal stated in Raising the Bar. It all feels very closed off, quite repetitive, and featureless overall – and is mostly memorable for its really great use of set pieces and story development. For Black Mesa, the larger scope of the Source engine allowed us to take those outdoor areas and make them feel like they are part of a really large world in the middle of a New Mexico desert. I think it is fairly indisputable that our version breaks the claustrophobia far more than the original does. A great example of this is the cliffside vista on the map C2A5C, which anyone vaguely familiar with Black Mesa will probably able to recall. In the original this was just a simple 2D painted background which was really, really limited. Not only did we expand it into a fully 3D, beautiful backdrop, we also expanded it into part of the larger world by having the structures in the distance destroyed via airstrike – a memorable scene in and of itself which helps to break the player’s bubble and show them that things aren’t just going badly for him [Gordon], there’s stuff going on absolutely everywhere else too. We also did this in many other ways in other parts of the chapter. Sound in particular plays a huge role in this. 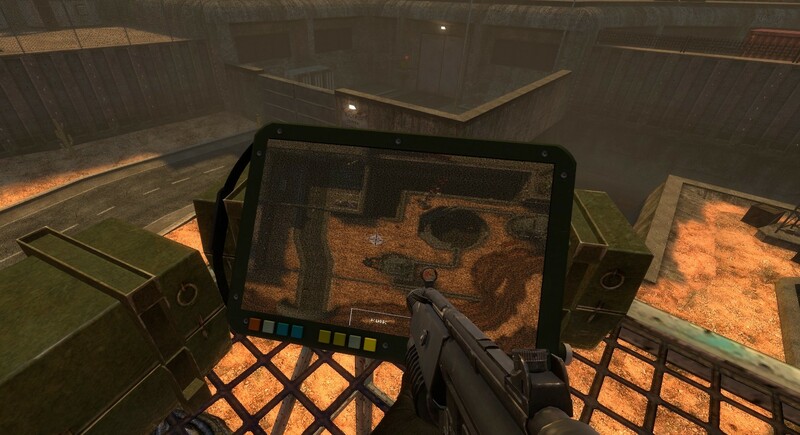 In our version of Surface Tension you can hear distant airstrikes, gunfights, and many other small touches around the maps which simply couldn’t be done back in Half-Life 1’s day. The Surface Tension Uncut maps will take this a step even further. We’ve taken things several notches up with this one and designed an extremely expansive and interconnected environment which ties into the larger world and really breaks down what I would consider to be the weakest segment of the original chapter. Where Half-Life 1’s Surface Tension at this point devolved into several repetitive boxy hallways, we have now blown them up into huge, realistic environments which we tried hard to visually connect to many other parts of the facility and ascribe a useful, real-world purpose. Every hallway and room tells a story of its own now, and sometimes these are stories which run outside of the player. We think this really helps to fulfill the goal for the chapter stated in Raising the Bar. Did you face any particular challenges in recreating this chapter? 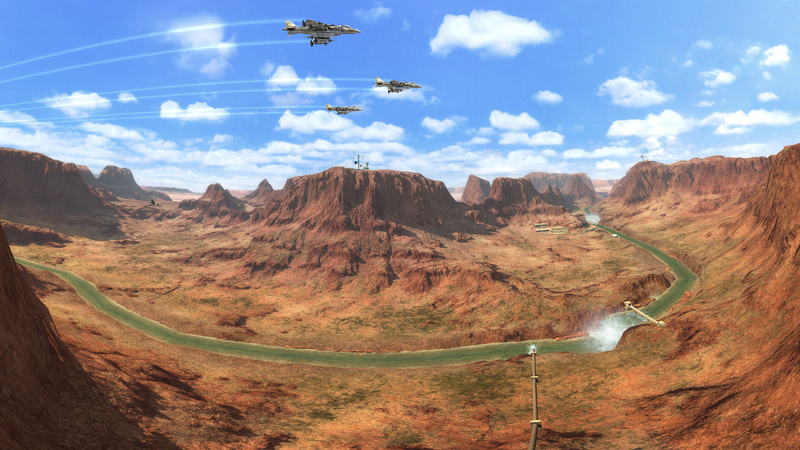 How did you fare with the part where the player can summon missiles to destroy the landscape? One of the greatest challenges of the chapter was trying to come up with a theme and architectural style which was cohesive and true to Half-Life 1, but also had its own unique character. We originally started out by sticking fairly closely to the HL1 style and lighting, which was blueish and gray, but later settled for the more colourful and stylized design (built more around reds and oranges) which you see present in our game today. The set pieces were challenging too, because they were all incredibly memorable parts of this chapter in Half-Life 1. If you ask anyone what their favorite moment from Surface Tension was in the original, you will probably hear a huge variety of different answers because it had so many memorable and well executed set pieces. Whether it was the Manta Rays dropping off Alien Grunts, the game of “whack-a-Gordon” with the Abrams tank, the jets flying past on the Cliffside scene, or the laser trapped explosive warehouse, this chapter was full of set pieces which we had to deliver well. This was a particularly great challenge due to the Source pipeline. Very often the set pieces had to be divided between multiple disciplines (choreography, animation, sound, level design, modelling, etc), and it could get really challenging – particularly on the Surface Tension Uncut stuff, where the Gargantua introduction scene was a nightmare from an implementation standpoint. The part with the missiles (which we call internally the “Garg Arena”) was a particularly tricky section to design. There were just a lot of major design obstacles to overcome. The first major challenge was the controls of the actual airstrike designator itself. In the original the controls for the designator were just really cumbersome and finicky, and the actual device and map itself was absolutely enormous for what it was supposed to do. We modernized it into something more manageable and sensible, and tied it into a fancy new interface – more real time and less clunky. Getting that to work programmatically was pretty challenging as well! We also had to figure out how much we wanted physics and the airstrikes to play with the surrounding environments. The radio tower collapsing and forming a bridge through the wall was one such idea which made it through to the final release, a remnant from the original’s ability to destroy quite a few things in that courtyard. The second challenge was the design of the arena and the area itself. If you really look at the design of that area in Half-Life 1, it just made no sense at all, as well as holding little or no real world purpose – particularly the entrance to the Lambda bunker. The arena underwent many major overhauls from its initial design. I redesigned it for the retail release (after the mod release but before now) and then we have now further redesigned it for the Surface Tension Uncut update. Are you planning on updating the chapters in order of appearance? If not, can you give us some insight into how you pick which ones will feature in the next updates? We don’t have any further chapter updates planned as of yet. Any updates which we roll out in the future will likely be alongside features or assets developed for Xen or maybe multiplayer. We are fairly fluid in our development, in this sense. Though it probably would have happened regardless, one of the reasons Surface Tension as a whole is being updated (rather than this update just being the Surface Tension Uncut maps added onto the end of the chapter), is because of the creation of newer assets which were developed for other parts of the game. Godrays, for example, were written for Xen. We had quite a lot of new, really nice looking rock assets made for the new multiplayer map dm_stack. 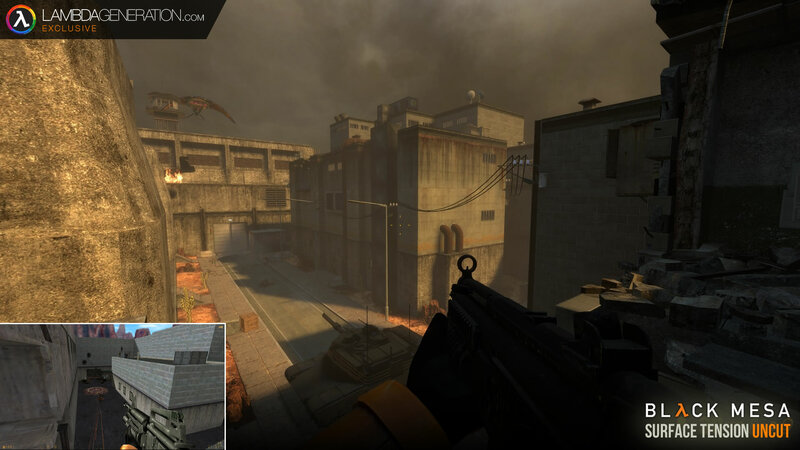 We had some brilliant new cinder block textures made for Crossfire, which far exceeded the old ones in quality. We had many new, higher quality world textures and models at our disposal in retail because of multiplayer. For Xen we had been testing a technique which used World Machine to generate some amazing 3D skyboxes, and this resulted in the creation of the wonderful vista we use in Surface Tension Uncut. All of these new assets and features influenced our decision to update Surface Tension as a whole. None of this could have been possible without multiplayer and without the retail release in general and the bump in overall quality which has come with it. Any chapters we decide to update in the future, if we do any, will likely happen as a result of developments for Xen which we decide to bring back into the existing campaign in some way. Of the all the chapters, which one is your favorite? What about it do you like? If it’s one of the ones that have not yet been updated, is there anything in particular you’re looking forward to recreate or add to it? As a team member who originally started out as a fan, this question is quite poignant for me. Black Mesa was a huge level design inspiration and the main reason I got into mapping. My favorite chapter personally was Unforeseen Consequences. 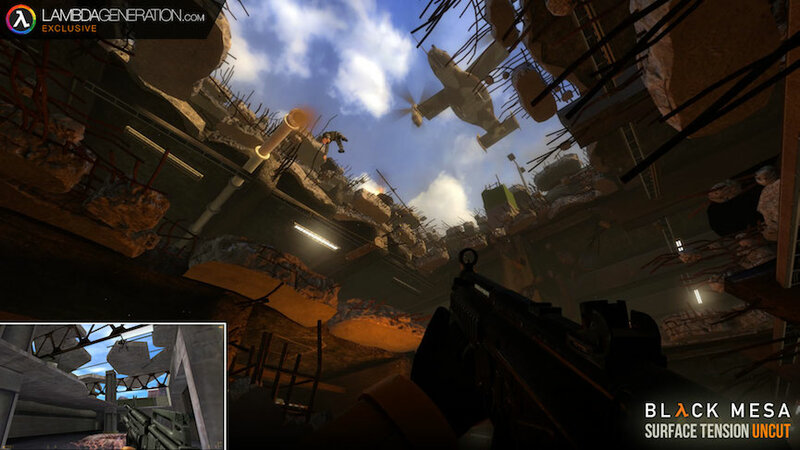 It just took the atmosphere of destruction and chaos from the original Half-Life and really cranked that dial up to 11. I remember the level of detail in that chapter just blowing my mind, with all the sounds, effects, just how bad everything had gotten. And we had even put our own unique game play spin on it by moving the crowbar to a lot later in the chapter (which turned out to be quite a controversial change which some people did not like so much!) To me it made the chapter feel even more about desperate survival and the story of the world around you, rather than yourself. That chapter will probably not be updated further, beyond bug fixes. This one is probably going to be a very loud “NO”, but is there any chance you can give us a rough time frame for when the whole game will be completed? To put it less glibly, we are really trying to steer clear of giving any kind of time frame, at least for now. This is mostly because doing so would be entirely guesswork for us. One of the things we think is quite tough to understand is that with a project like ours, while what you see in the game is the result of countless hours of hard work and talent that we put into Black Mesa, what you don’t see is the much higher number of hours that goes into work which ends up on the cutting floor. For example – the helipad area on C2A5G. It’s really simple. It is just a helipad next to a road by some buildings. You wouldn’t believe that it took me between 10 – 20 hours to design just the layout for that section. This is even with a previous base to work from – my old mod material! But it did! We work to such a high standard on Black Mesa that the amount of work we end up completely scratching or redoing is quite unbelievable. It’s all just a natural part of the necessary process of iteration and I don’t think people realize quite how time consuming this aspect of game development is, even for relatively simple things like a helipad. Now take that and apply it to Xen – an entire alien border world which was considered to be the most heavily flawed section of the original; incredible in scope and ideas but mixed in execution. 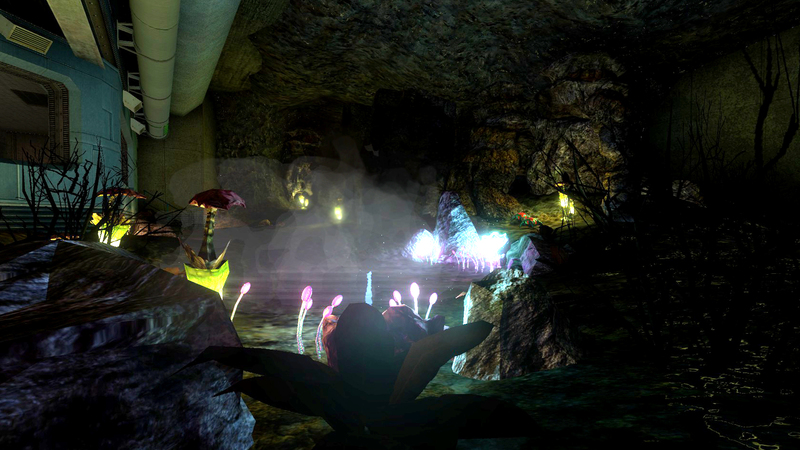 The process of iteration for Xen has been and will continue to be gruelling, but we will keep pushing through it until we deliver an incredible, beautiful and fun ending befitting of the Black Mesa experience. Not only that, but the Source engine itself and its development pipeline at its core are just not very suited towards creating the kind of world. We’re pushing the limits in every sense. We won’t be providing any estimates for Xen until we are reasonably confident ourselves that we can stay true to our word. Any special messages for the people who keep asking for a specific chapter? If it’s On a Rail – I will put my expansions to it on the workshop when I am back from my holiday! If it’s Xen – please be patient. Our track record with BMS shows that we will do it. It will be awesome! This interview gave us invaluable insight on what happening with Black Mesa’s development, and we hope it removes any concerns you might have had with the completion of the game. We would like to thank Chon again for the wonderful responses and transparency. We are announcing that we will be hosting a livestream of Black Mesa Deathmatch with a bunch of the Crowbar Collective developers. During it, we will be giving away 10 copies of the game to anyone who joins the stream chat. We will be joined by Black Mesa’s lead level designer Chris Horn as well as voice actor Kevin Sisk (voice of the Security Guards!). Edit: The livestream has finished now, here’s the recording. 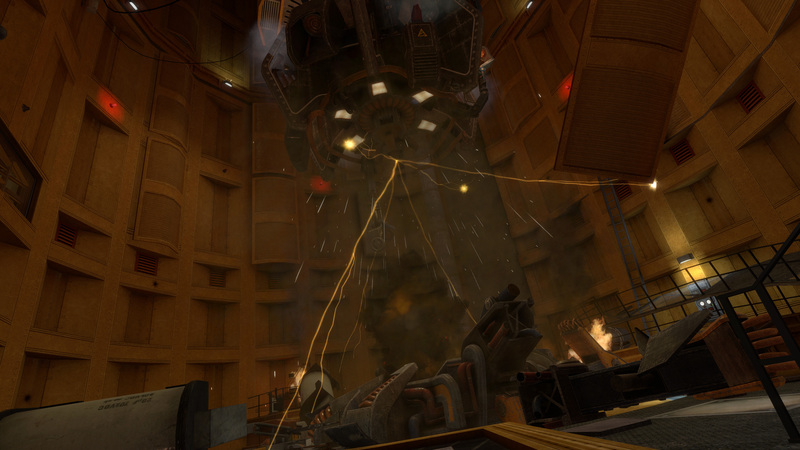 The Black Mesa developers had a lot of interesting stuff to say, and answered a lot of burning questions from the community. Also well done to all those who won our Half-Life trivia, all giveaway copies have been sent out! 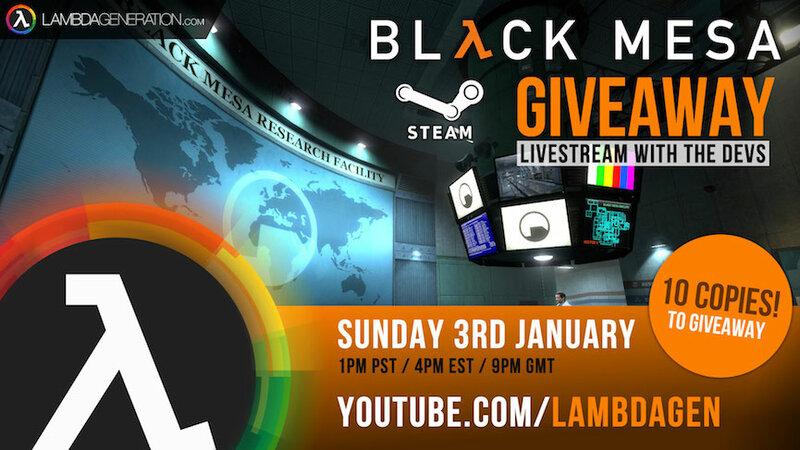 Follow @LambdaGen on Twitter for more Black Mesa updates. Thank you for the interview, this is fascinating stuff! Not only does Chon work on the design team, he also does a great job moderating the steam community forums. Thanks for the interview!